Sometimes your business stays limited to your country due to the inability to get international customers. This will always be a problem if you or your organisation has language limitations. And if language is a problem it will not be easy for you to expand your business. BabelWithMe is a web based service that aims at removing this language divide from your business and lets your people in the business to communicate with your clients from any part of the world. 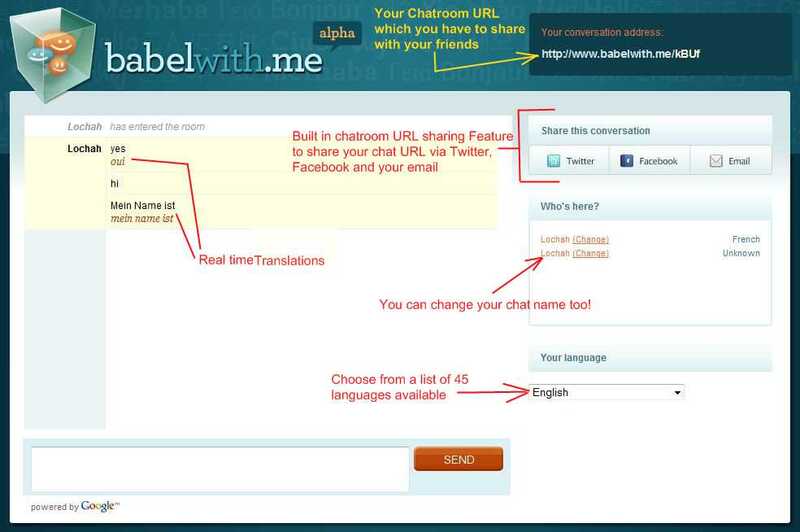 BabelWith.me is a simple, free group chat tool that lets you communicate in one language or multiple languages in real-time without the language barriers - BabelWith.me automatically translates each message as you type, and supports forty five (45) languages as of now. The best part about BabelWith.me is that it is a web-based tool, so you are not required to install any software to use it. You just need to create a conversation for which you'll get a special URL address for your chatroom. You can share this URL with your friends or customers using BabelWithMe's built in Twitter, Facebook, and email integration and invite them to join the conversation. How can you use this tool to expand or enhance your business? This tool can be definitely used by your business to provide customer support to your customers who do not speak the language as you do. All your tech support guy needs to create a new conversation and share the URL of the chatroom with the customer. Then your tech support guy and your customer can have a regular conversation. Since the conversions of the languages happen in real time, your tech guy and your customer can see both the original language and the translated version. One very concerning question is the URLs. As you must have seen, the system at BabelWithMe generates random URLs for your chatroom. Since it has four characters in the relative URL (such as xYtp or ddSA), the possibility of an eavesdropping in your conversation cannot be ruled out, although you might not have shared the URL. Anyone, although this is all about probability, can enter random URLs and land up on any chat room.